Sisira Lohawiboonkij is from Thailand and currently an MSc student in Project, Program & Portfolio Management and Business Development at SKEMA Business School in Paris, where she had a Contract Management course under the tutorage of Dr. Paul D. Giammalvo, an active member of Guild of Project Controls. 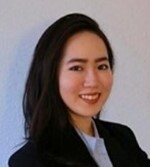 She has a Bachelor’s Degree in Business Administration and Finance from Ludwig Maximilian University in Munich, Germany where she, after graduation, worked in Finance at Deutsche Bank as a Financial Analyst. Afterward, she embarked on another career path in Education Technology at Klett Group in Stuttgart where she worked on a school administration software project until 2018 before moving to Paris to pursue a Master’s Degree in Project Management. She is also an active member of PMI® and The Guild of Project Controls.